Printing business stationery for over 33 years, we provide businesses with color letterhead, envelopes, and/or business cards. Offering a wide variety of standard and premium paper stocks to choose from, your one color, two color and full color stationery printing needs are in good hands. Stationery is typically printed on 60lb opaque offset stock, however we also regularly stock and print on varieties of strathmore, classic crest, linen, natural white and other premium letterhead and matching envelope stocks. Also, additional discounts are offered for multiple lot printing. 1. 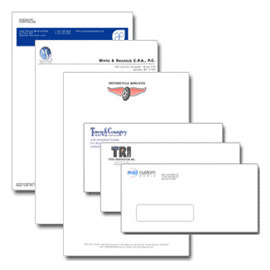 Select options for your letterhead and/or envelopes. 2. Add letterhead and/or envelopes to your list.